Great Yarmouth Market07795 428167work MarketGreat Yarmouth central market is open 6 days a week from Monday to Saturday, with a wide range of fresh produce stalls, including takeaway food and famous Great Yarmouth chips as well as clothes, plants and household goods. The covered central market has 36 stalls of varying sizes, including fresh fish stalls, a local butcher, baker and colourful fruit and vegetable stalls, as well as several stalls serving hot food to take away including pies and peas, portugese food, teas and coffees and hot bacon rolls as well as several traditional Great Yarmouth chip stalls, reputed to be the best chips in the resort. There are also stalls selling clothing, household goods, pet food, DVDs, books and collectable items. The market is at the very heart of Great Yarmouth, and the community of traders are always happy to chat with their customers, making sure friendly customer service is part and parcel of market life. Market Days take place on Wednesday and Saturdays all year round, plus Fridays from Whitsun to the end of October when the cobbled market place to the north of the covered market is occupied by many other traders who arrive in town to ply their wares, with a large range of additional goods, including silver jewellery, DIY tools and equipment, toys, games, mobile phone accessories, ladies and gents fashions, pet beds and blankets, bird food and garden accessories. 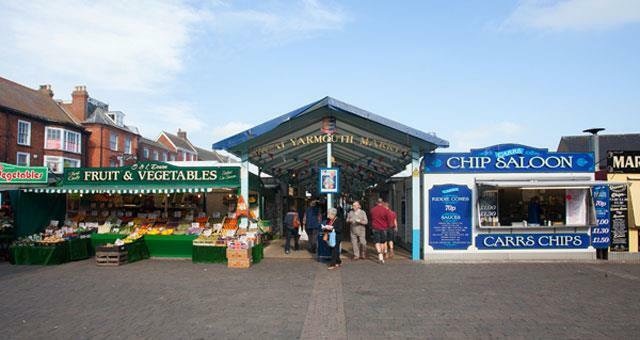 Great Yarmouth central market is open 6 days a week from Monday to Saturday, with a wide range of fresh produce stalls, including takeaway food and famous Great Yarmouth chips as well as clothes, plants and household goods. Try the new click and collect service available now using shopappy.com - order your holiday supplies ahead and collect from either the market traders themselves or from The Market Tavern pub situated in the Market Place. On arrival in Great Yarmouth follow signs to the town centre. Buses stop at Market Gates shopping centre, just a short walk through the mall brings you to the market place. 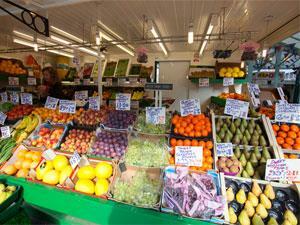 Great Yarmouth station is a short 5 minute walk from the market place down The Conge.